Lesson 1 explained the time value of money and how to calculate the annualised basis of a futures contract. Lesson 2 will focus on the basis term structure and different ways to profit from curve shifts. The basis term structure is a graphical representation of the annualised percentage basis for different maturity futures contracts. For a Bitcoin/USD future, being in contango means that the USD interest rate is higher than Bitcoin’s. Or put another way, traders believe that Bitcoin will appreciate in the future vs. the USD. Below is a graphical representation of the upward sloping term structure. The best trading strategy for playing an upward sloping yield curve is a carry trade. Selling the longer dated XBTH16 and buying the shorter dated XBTU15 allows traders to capture the interest rate differential. When XBTU15 expires, the trader will purchase the XBTZ15; after XBTZ15 expires, the trader purchases XBTH16 to close the position. 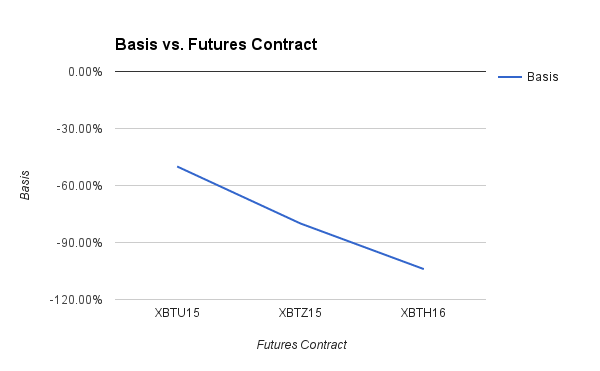 As time elapsed the trader gained profited more from the fall in XBTH16’s price, than the loss experienced when XBTU15 & XBTZ15 expired. This is called positive carry, or positive Theta. The risk to this strategy is that the interest rate differential between XBTU15 & XBTZ15 or XBTZ15 & XBTH16 increases dramatically when the trader short rolls the position. The trader is short rolling, because he is short the near month contract and must buy it back, and then short the farther month contract to stay hedged against his long XBTH16. For a Bitcoin/USD future, being in backwardation means that the USD interest rate is lower than Bitcoin’s. Or put another way, traders believe that Bitcoin will depreciate in the future vs. the USD. The best trading strategy for playing a downward sloping yield curve is a carry trade. Buying the longer dated XBTH16 and selling the shorter dated XBTU15 allows traders to capture the interest rate differential. When XBTU15 expires, the trader will sell the XBTZ15; after XBTZ15 expires, the trader sells XBTH16 to close the position. As time elapsed the trader gained profited more from the rise in XBTH16’s price, than the loss experienced when XBTU15 & XBTZ15 expired. This is another example of positive carry or Theta. The risk to this strategy is that the interest rate differential between XBTU15 & XBTZ15 or XBTZ15 & XBTH16 decreases dramatically when the trader long rolls the position. The trader is long rolling, because he is long the near month contract and must sell it, and then buy the farther month contract to stay hedged against his short XBTH16 position. In the Lesson 3, I will explain some basics about risk management. The terms Delta, Dollar Value of 1% (DV01), and Theta (time value) will be introduced. Soon after spot Ether trading began, leveraged products on the Ether/Bitcoin (ETHXBT) appeared. BitMEX was the first exchange to offer leveraged trading via a futures contract called ETH7D. The leading spot ETHXBT exchanges Poloniex and Kraken, have just started offering margin trading. This post will explain the differences and costs of margin trading vs. futures trading of ETHXBT. Margin trading requires that traders borrow Bitcoin to go long ETHXBT, and Ether to go short ETHXBT. Traders will then place their leveraged orders into the spot order book. The ability to borrow Bitcoin and Ether is not a sure thing. On Poloniex and Kraken other users must lend out their excess Bitcoin or Ether. If there is no supply, margin trading cannot happen. 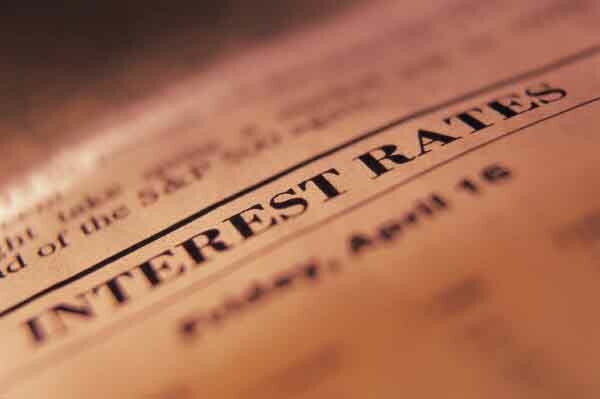 The interest rates paid are very volatile and can be expensive at times. The BitMEX ETH7D futures contract expires weekly every Friday. Each contract is worth 1 ETH, and traders must post Bitcoin as margin to go long or short. BitMEX allows 5x leverage. This means that there is no need to borrow ETH in order to short the ETHXBT exchange rate when using ETH7D. There is no daily interest rate charged either. The difference between where you buy or sell ETH7D and the current spot ETHXBT rate at the time represents an implied interest rate. For traders who have Bitcoin, ETH7D represents the easiest and cheapest way to go both long or short with leverage on ETHXBT. The hottest new altcoin on the block is Ether (ETH). Ether is the token used to power the Ethereum protocol’s smart contracts. Now that Ether is freely tradable, this post will explain the different ways to express bullish and bearish views on this new cryptocurrency. Buying and selling Ether on a spot basis is quite simple. The most liquid Ether currency pair is Ether/Bitcoin (ETHXBT). Poloniex and Kraken are the leading exchanges by volume. To buy Ether, send Bitcoin to the exchange and exchange it for Ether. This must be done on a fully funded basis (i.e. there is no leverage). If you hold physical Ether, you can exchange it back for Bitcoin. Selling Ether you don’t possess is not possible. For most of the readers of this blog, leveraged trading / speculating presents a more interesting way to trade Ether. With the exception of Bitcoin and Litecoin, leveraged or derivatives trading on altcoins was not possible. BitMEX recognised that Bitcoin traders would like to speculate on Ether with leverage and using only Bitcoin as margin. BitMEX launched the ETH7D, weekly expiring ETHXBT futures contract, when spot trading became available last Friday. Each ETH7D contract represents 1 ETH. The contract expires each Friday at 12:00 GMT on the ETHXBT exchange rate. All margin, profit, and loss are conducted in Bitcoin. The maximum leverage allowed is 5x. 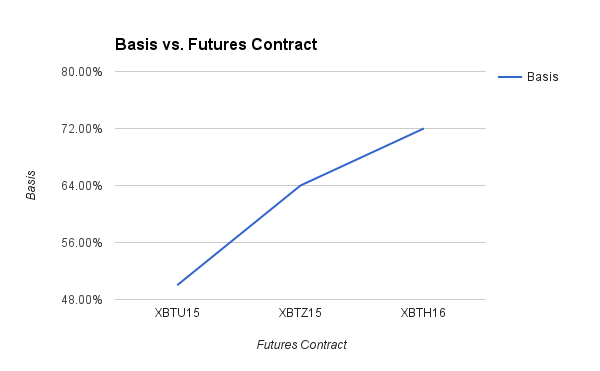 BitMEX Ether futures contracts allow traders to speculate on the future value of the ETHXBT exchange rate. A trader who wishes to go long 1,000 ETH, must buy 1,000 ETH7D contracts. The beauty of ETH7D is that it requires Bitcoin as margin. The maximum leverage is 5x. If the ETH7D price is 0.005, the trader must post 1 Bitcoin as margin (1,000 Contracts * 0.005 ETHXBT * 20%). If the price rises to 0.006, the profit is 1 Bitcoin = (0.006 – 0.005) * 1,000. Short selling, or selling something you don’t possess is usually impossible with altcoins. Using ETH7D, traders are able to placed leveraged bearish bets on Ether as long as they own Bitcoin. For example, a trader who wishes to go short 1,000 ETH, must sell 1,000 ETH7D contracts. Again only Bitcoin is required for margin. If the ETH7D price is 0.005, the trader must post 1 Bitcoin as margin (1,000 Contracts * 0.005 ETHXBT * 20%). If the price falls to 0.004, the profit is 1 Bitcoin = (0.004 – 0.005) * -1,000.